Santa Rosa, CA - When Steve Soldis was pulled over doing 50 miles an hour on Summerfield Road, he knew he would get a ticket. After all, Soldis owns an online traffic school and he knows a thing or two about the state Vehicle Code. "Nothing to be bragging about," he said. "Everybody should follow traffic laws." But at the same time, the Santa Rosa resident drives the area frequently and his experience and intuition suggested the posted 35-mph speed limit was too restrictive. Soldis contested the ticket and in January a Sonoma County judge threw it out, characterizing that section of Summerfield Road as a speed trap. Santa Rosa police since have stopped using radar on Summerfield, city bureaucrats have been scrambling to reverse the judge's ruling and officials have reviewed other streets where speed limits were set lower than they might be based on how fast people actually drive. "The city is setting speed traps and going out and enforcing these speed traps with radar," Soldis said. "It's abusing their power." At issue is a provision of the Vehicle Code that requires traffic surveys of roads where radar is used. The surveys are available at traffic court and must be submitted by officers when a radar ticket is contested. Although the surveys include a variety of elements, including accident records and road design, the heart of them is a poll of prevailing speeds. The speed poll determines a reasonable speed for each road, based on how fast 85 percent of those observed typically drive. Officials have some latitude in setting the speed limit higher or lower than the prevailing speed, but that discretion is limited. In the case of Summerfield, Traffic Commissioner Larry Ornell ruled that the city's traffic survey of the street between Parktrail Drive and Hoen Avenue was "inadequate and does not justify the posted speed limit." In effect, Ornell said, "there was a speed trap." City officials disagree and hope they can do the paperwork to justify the 35-mph limit on Summerfield Road for future enforcement. Santa Rosa has about 200 areas along about 90 city streets requiring periodic traffic surveys to allow the use of radar. Among those are about 12, like Summerfield, where the city has set the speed lower than the normal flow of traffic for a variety of safety-related reasons, Police Sgt. Doug Schlief said. One example is Calistoga Road, from Highway 12 to Montecito Boulevard, where the speed could be 40 mph. But the city decided to set it at 35 mph because of accidents, crosswalks and an elementary school, Schlief said. A study also is under way on Fountain Grove Parkway, where cars typically race between east and west Santa Rosa, often much faster than the posted 35- and 40-mph speed limits. However, that study is the result of neighborhood concerns, not worries about whether the existing speed limits constitute a speed trap. Although they believe the 35-mph limit on Summerfield is reasonable, police and the city's traffic engineer agreed with the judge's decision and his criticism of the city's traffic report. "We felt the judge probably did the right thing," Schlief said. Gene Benton, Santa Rosa's traffic engineer, even took responsibility for the judge's ruling. "It's my mistake," he said. "I didn't provide enough information to help him make his decision." Benton said he is putting together a more detailed traffic survey for the area, including statistics on pedestrian and bicycle usage. He hopes that once submitted, the judge will agree that the 35-mph limit is reasonable. "We believe there is enough to allow us to retain the speed at 35 mph," Benton said. "For instance, two school crossings take place in the area and there is significant pedestrian movement and bicycle action." The existing Summerfield survey, updated last in October 2003, determined 85 percent of drivers drove the stretch at 42 mph. State law allows the city to go 5 mph higher or lower, to the nearest rounded speed, such as 40 mph or 45 mph. For the city to drop another 5 mph, it must show unusual roadside conditions that might not be apparent to a driver, said Sherry Gendelman, a San Francisco private defense attorney who also teaches a monthly traffic course at the San Francisco Hall of Justice. 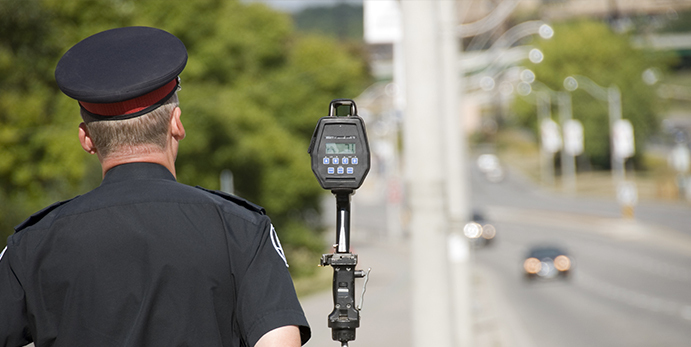 "You'd better be able to justify it, or you've created a speed trap," Gendelman said. Schlief said officers are awaiting any further ruling on the appropriate speed limit on Summerfield before resuming radar enforcement there. Police records show officers had given 16 tickets there in the last year. Schlief said that after the judge's ruling, he not only reviewed the Summerfield survey but looked at similar areas to ensure there was sufficient justification to support tickets in court. He determined that there was. Ornell said if the city submits a new speed survey and "it is adequate and passes muster," then Summerfield's 35 mph will be valid.